Miniature Dachshunds are cute and curious dogs and they do have some differences between them and their larger counterparts. The average size of a Dachshund is 8 – 9 inches tall and 16 – 32 pounds. The Miniature Dachshund is 5 – 7 inches tall at the shoulders and weighs up to 11 pounds. 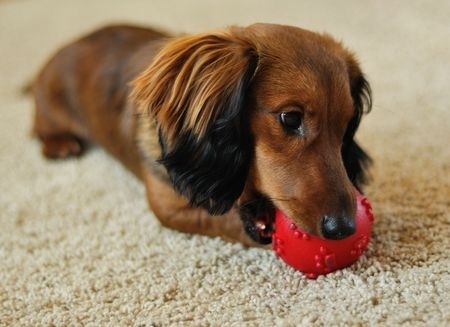 Nicknamed the “wiener dog” because of their long body and short legs, they do not lack personality. Sometimes they do take a bit of time to warm up to their new owners and strangers, but once they become close to you, they will be loyal to the end. They will also be amazing guard dogs alerting you to anyone approaching your home day or night. When it comes for caring for your Miniature Dachshund smaller dogs can have some difficulties, but if managed properly they will lead a full and happy life. Because of their short stature it is easy for them to gain weight if their food is not rationed appropriately. If your dog is jumping up onto a high bed or couch, it may be easy for them to slip a disk in their back. It may be a good idea to buy a set of doggie steps to make the transition much safer. These dogs were hunters before they were domesticated, they still love being outdoors. They will run around, chase small animals and frolic in the sun and snow. They will also be happy in an apartment, as long as they are taken for regular walks and have play dates with other dogs in your building or at the park they will be incredibly happy.